Over the weekend, I did something extraordinary. I stepped into the ring of a local, low-budget wrestling league and beat a man senseless with a chain. No, I haven’t been working with a personal trainer, and I’m not looking for new career opportunities. I was playing an independently-produced tabletop role-playing game, and in 2018, I plan to do a lot more of that. 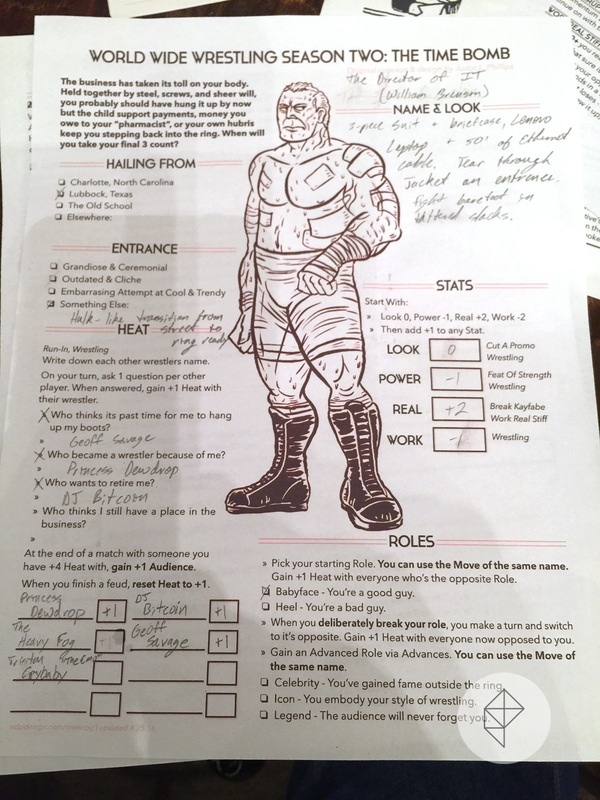 The game is called The World Wide Wrestling Role Playing Game, and it was created by artist and game designer Nathan D. Paoletta. The system is terrifically simple, relying on six-sided dice and a momentum mechanic. Essentially, players (as wrestlers) take turns beating each other up and playing to the crowd. When one of them succeeds at a given maneuver, they have the option of handing control of the match to their opponent, receiving momentum from the game master in return. Later, as the match progresses, that momentum can be spent to improve their rolls. But, as in all professional wrestling, the winner of a given match is decided ahead of time. Once in the ring, I could use my momentum to turn the tide of a match in my favor, actively working against the game master and steering the narrative of the night’s performance in my favor. It’s a tremendously flexible system and allows for adversarial engagements that break the traditional rules of tabletop RPGs. Making things even better, my game master had everyone create their characters and interpersonal relationships right there at the table. By the end of the game’s opening hour, we had all the makings of a primetime soap opera, and enough bitter rivalries to last an entire campaign. At one point, my character, an aging 40-something veteran who wrestled under the name “The Director of IT,” had vanquished his arch rival, a twenty-something YouTube personality called DJ Bitcoin, with the help of a monstrous heel called The Heavy Fog. It was glorious, and made all the better by television-style commentary from the other characters at the table and a live audience holding up signs around the table. It was a magical night, and it reminded me once again that there is more to tabletop role-playing than Dungeons & Dragons or Pathfinder. There’s an entire industry of small, independent authors cranking out exceptional world for you to play in. Their modules are often inexpensive and available as digital files, so that they’re easy to carry around. And, most importantly, they open up your roleplaying group to incredible new experiences. Maybe you’re looking to create your own weekly role-playing circle, or galvanize a newly formed party. Maybe the campaign you’ve been running in your D&D game is coming to a close, and like Polygon’s Griffin and Justin McElroy on The Adventure Zone podcast, you’re searching for the next new world that will grab your friends’ attention. Whatever your reason for branching out, there’s a few good ways to get started. Fiasco, by Jason Morningstar, isn’t a universe so much as it is a system. Players select from a number of “playsets” filled with characters and motivations, and then work together to create a two-hour, Coen brothers-style, comedy-action film. There are dozens of worlds out there for you to explore, and best of all, the system doesn’t require a GM. So even if you’ve been driving the narrative of your gaming group for years, Fiasco can help you get at least one night off. Dread, by Epidiah Ravachol, is a remarkable game system that completely avoids the use of dice. Instead, players pull a Jenga block every time they want to do something. Game masters can use the system to tell a story in any world they can imagine. Modules exist all over the internet, or you can simply steal another indie RPG’s lore and jump-start a campaign with a night of Dread. Better yet, go have fun in the Stranger Things universe while you wait for season three. If something so open-ended isn’t your bag, here’s a handful of recommendations. Some are sitting on my shelf right now, and others have only just come out on the market. Polish your monocle and gas up the dirigible in Brass & Steel: A Game of Steampunk Adventure. Brass & Steel is an excellent choice for history buffs, and contains a tremendous alternate history filled with political intrigue and amazing characters. Instead of dice, you’ll pull tarot cards to determine your fate. Like Dread, Ten Candles relies on building a sense of tension a the table. However, this game requires absolutely no preparation. It’s built for one-shot sessions, and takes two-to-four hours to play. 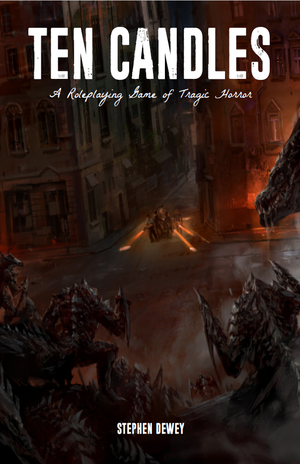 It’s described as a game of “tragic horror,” where there are no survivors. If your party is looking for something truly grim, this is a good place to start. Way, way over on the other end of the seriousness spectrum is Bubblegumshoe. The system is intended to help recreate vintage young adult detective novels, but there’s no reason you couldn’t amp things up a bit and riff on the latest season of The CW’s Riverdale, or even The Flash, for that matter. I’ve written about Kevin Kulp’s TimeWatch before, but if you happen to have a group of players that revel in outsmarting the GM at every turn, this system is a great way to flip the tables. It’s as frantic as it is collaborative, and does a good job of stretching players’ improvisation skills.